The California Bicycle Coalition, aka CalBike, continues to push for increasing funding for the Active Transportation Program, which currently receives $120 million per year. The bike coalition wants the state to add $100 million to the program, which sounds like a lot but is roughly one percent of the total transportation budget—even though bike and walking trips make up nearly 19 percent of all trips made in California. The state budget planning process, in which the two legislative houses and the governor negotiate a final budget by June, is one avenue for getting more funding. Also in play are several bills that were introduced in last year’s Special Session on Transportation. Senator Jim Beall’s (D-Campbell) proposal to raise transportation funds through higher gas taxes, S.B. X1-1, would limit highway expansions and require complete streets improvements. Senator Jim Frazier’s (D-Oakley) transportation funding bill, A.B. 1591, has some similarities. The Special Session on Transportation lost steam at the end of last year’s session and these two bills were left hanging. However, now that the other Special Session—on health care funding—has successfully concluded, attention will soon turn to the unfinished business of transportation funding—so stay tuned. Additionally, CalBike is sponsoring a couple of bills that will benefit bike riders in other ways. One, A.B. 1982 from Streetsblog California Streetsie winner, Assemblymember Richard Bloom (D-Santa Monica), calls for traffic signals to be timed to give bike riders a “green wave”—that is, any vehicle traveling at an average speed of 12 to 15 miles per hour would get a green light as it arrives at intersections. Under Bloom’s bill, when money from the state’s cap-and-trade program is used to fix signal timing so that traffic runs smoothly—thus reducing emissions, a requirement for receiving cap and trade funds—the signal timing must be set to match the speed of the average bike rider. That would give bike riders a big advantage, speeding up and smoothing bike commutes. “Green waves” have been successfully implemented in San Francisco along Valencia street, where they make bike and car speeds about the same. That is another advantage of “green waves” at that speed: they encourage slower, safer driving by all vehicles. Bloom is also co-author, with Evan Low (D-Silicon Valley), of A.B. 2796, which would require the California Transportation Commission (CTC) to award Active Transportation Program funds for planning and community engagement in disadvantaged communities, as well as other non-infrastructure projects. This has long been a subject of some contention in workshops on guidelines for the Active Transportation Program. The CTC tends to award money to infrastructure projects, and Commissioner Carl Guardino, who was recently reappointed, has made it clear he doesn’t want to allocate any money for planning. However, it’s hard to build infrastructure if you can’t plan it, and many areas of the state have very little capacity (that is, money) to support planning for bikes, let alone conduct real community outreach that lets planners know what would work best for people. Low and Bloom’s bill would also require that between ten and thirty percent of ATP allocations go to programming—bike education, for example, or Safe Routes to Schools programs that encourage bicycling. Given how woefully inadequate most bike and pedestrian infrastructure is in California, even with new projects being funded and built thanks to the ATP, programs that encourage people to use them are as important as building them to begin with. A.B. 2796 would require a minimum of five percent of ATP funding in each distribution category (that is: statewide, small urban/rural, and regionally-chosen) to go for planning, and between ten and thirty percent for programming. Another bill sponsored by CalBike would make it clear that bike riders can ride side by side on the roadway. It’s already legal for them to do so, but a lot of people, including some police, don’t know that. Assemblymember Phil Ting (D-San Francisco), whose bill last year to prohibit charging bikes and pedestrians bridge tolls was signed into law, is working on A.B. 2509 to clarify existing law. The League of American Bicyclists has long taught that what the law says about staying to the right does not mean that bicyclists must squeeze over to the edge of the road. In its bike safety classes, it teaches bike riders that they are allowed to move away from the right edge for many reasons, including to avoid objects, to pass slower traffic, to turn left, and more. Ting’s bill would do two things. First, it would make it clear that the right-hand rule doesn’t apply to people riding in a bike lane, so if you can safely ride side by side in a lane, that is okay. Second, the bill would add the word “safe” to clarify that a bike rider does not have to hug the curb if it is not safe to do so (a bike rider going slower than “the normal speed of traffic. . . shall ride as close as is safe or practicable to the right-hand curb”). CalBike is using the Twitter hashtag #legalizehandholding to get the idea across. 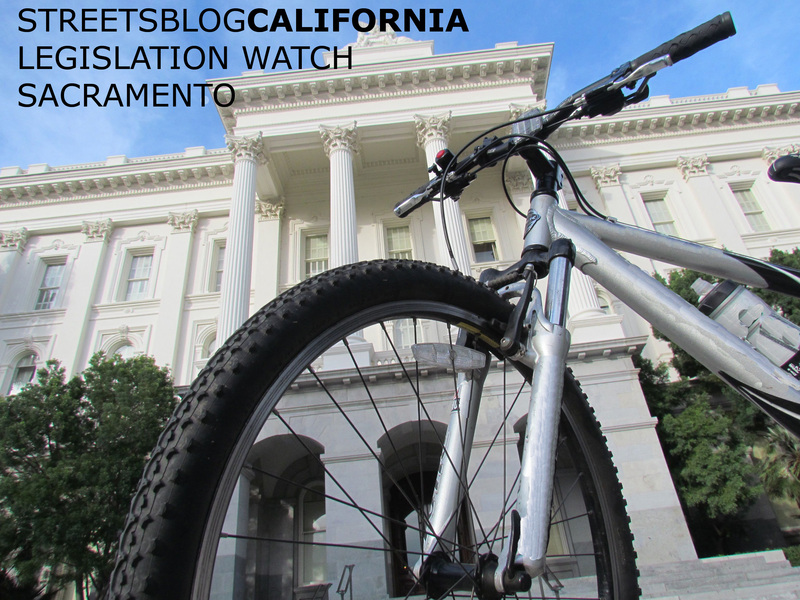 To see what else they’re tracking, check CalBike’s Legislative Watch page. Safe Routes to Schools is keeping an eye on these bills as well, and several others; see here for its update. All of these bills are, of course, subject to negotiation. Stay tuned to see what happens as they wend through the legislative process. How exactly would removal of 21202 VC be beneficial? Last night, there was a meeting at California State University at Northridge to discuss the needs of the community for greater transportation within the valley. One statistic that stood out which would fit nicely into this discussion was stated by Councilman Mitch Englander. He said that terrible roads (infrastructure — pot holes, cracks, etc.) were to blame for the excessive cost of car repairs. The statistic is that car repair cost in California was double the national average due to the conditions of our roads. More money needs to be directed toward active transportation. More bicycles on the road would reduce road wear and tear. Couple that to more use of the extensive train system and the read is extended to a large extent. Why doesn’t CalBike simply lobby for the repeal of CVC 21202? We are equal road users, let’s remove the laws that make us second class road users.